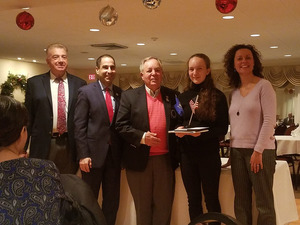 Wooster School twelfth grade student, Julia Bauer, received the Student of the Month Award from the Danbury chapter of the National Exchange club on January 10. The Danbury Exchange Club honors high school seniors who are outstanding students in school and community who have volunteered for service activities and have demonstrated academic success and leadership qualities. Mr. Christopher Priedemann, Upper School Science Teacher, attended on behalf of the school, and Mr. Priedemann spoke to introduce Julia during the awards presentation. There is consensus among the faculty at Wooster School: Julia Bauer is one of the most gifted and hardworking students. She embodies everything that a teacher could possibly want in a student; curiosity, the ability to make connections, amazing work ethic, wonderful daily preparation and willingness to share her insights with the class, either in the form of well-developed questions or in the form of answers to the teacher's questions or classmates’ questions. As well as being a top student academically, she stands out even more as an exceptional human being, exemplifying humility, empathy, compassion and a remarkable drive to make her surroundings better, not just for herself, but for everyone around her. Julia takes many periods of her free time to help others outside of the classroom. She has a remarkable drive that is tempered only by her extraordinary civility. It would be easy for her to give up on some of her classmates, but she realizes that if she is going to move as fast as she would like, she is going to have to help others. She is true leader in the classroom, answering and asking great questions for her benefit and for the benefit of all around her. As well as being humble, she is driven to help others in a number of ways. She is the President of the school Gay-Straight Alliance, is a valued member of the Wooster School Center for Social Impact, is a valued member of the student ambassador program, and has been a vocal member of her class in social and academic affairs. In short, she is a true leader, willing to lead through hard work and inspiring those around her to meet their potential as well. Not only is Julia a recognized force in the classroom and in clubs, she is also a driven athlete as well. She was voted to be the Captain of her award winning Cross Country Team and she has been a great ambassador for the sport. She has won All-League Honors as a member of the team and she helped push her team to win the HVAL Cross Country Championship. She, as would be expected, deflects all credit from herself, giving it to teammates and to her coach. We at Wooster are incredibly proud of Julia and can't wait to see what great things lie ahead. Congratulations, Julia!